The quietest month so far in terms of races but my busiest as captain. I need to firstly start this report by thanking Lara, Sue and Lex with the team of marshalls that supported us for all of their help organising the Junior Race for the Friday 5. They were my calming influence although I am hoping none of the kids noticed my lastminute.com state!! Then Steph (and Eric) helped me with the Juniors at Ekiden and my true life saver was Caroline who came to my rescue in organising the post club championships barbie. The food which you all bought and weather was scrummy and it turned out to be a great night. I did laugh at the speed that Sandra’s cake and Ruth’s chocolate mousse was demolished!! Strange month as I haven’t sensed the majority of you all raving about your running. I don’t think any of you felt you had a good race at the Bentley 5 and then, apart from Natalie who got her first standard and a pb, no one seemed to be raving about their runs at the Club Champs. Let’s put it down to the very warm weather on both evenings!! We were well represented at Ekiden and you all run your hearts out. As I said at club the other week, Ekiden is full of sharp bends and on grass. Don’t over analyse your times as it is not a pb course, it is off road!! Nice to see that other teams have taken a leaf out of the Bentley book and are now waiting for their final leg runners. The younger girls did well at both the Bentley Junior Race and Ekiden – Katie P, Milly, Tiegan, Amie, Hallie, Eloise, Ella Grace, Katie S, Elisha, Lucy and Alice – the last five girls all running their first proper race for Bentley. 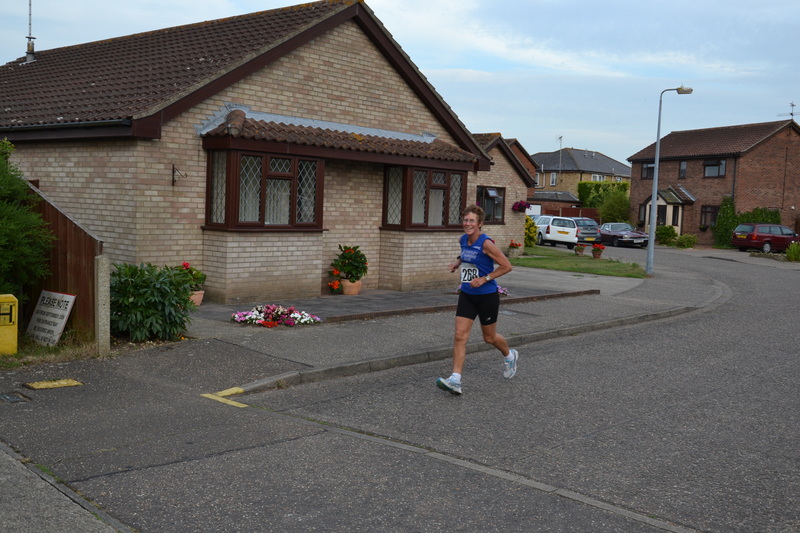 Well the 5k races are coming to a close – there have been 2 Harwich 5ks this month – numbers seem to be well down on previous years – Rita, Sandra, Clare and Louise flying the flag for GBRC and Clare finishing in style with her first standard. Well done you – you did it! Janine fitted in a 5k in the City of London beating Paula Radcliffe to the finish line in the process. Karen and Lesley turned out on what had to be the hottest day of the year to run the Brantham 5 mile – I really don’t know how you got round on that evening. I was sweltering around the woods running at 8pm. Rodger organised his latest trial run last weekend at Long Melford and Tricia, Tonie and Les all run great times not far behind the first men home. The next trial run is at the end of the month (31st) at Hadleigh – please support Rodger, he puts so much work into them and would be good for a few more people to try them out. Finally, in terms of races, I am in total awe of Sophie Apps who completed the Outlaw Iron Man in 13:01:11 – that is a 2.4 mile swim, 112 mile bike and a just a little marathon to finish!! A big well done. We welcomed Jodie Chippendale and Alison Clarke to the club and those who go on Wednesday will have seen them – go and say hello when you next see them. We had another new lady join yesterday but I don’t know her email address yet so I will mention her officially next month. Good news as there have been loads of new men over the last couple of months and not many ladies. So to my runner of the month. There are many reasons why I am giving this person this award this month – her sheer determination, her inspiration to others and her encouragement of others to reach their potential. On 5 May 2014, she had a bad fall from her bike knocking herself out (she still doesn’t remember what happened) and suffering bad cuts/bruises all over. If that was not bad enough, 10 days later, her hubbie had a subdural Haematoma and was in HD Neurosurgery ward at Queens for a week and then another 5 days in Colchester General. She had to pull out of the Halstead marathon as it was too soon after her accident (would have been her first (running) race since she turned 70) and then she had to pull out of the Duathlon world championships. In the meantime, the club have had to write new standards for a woman over 70. She is returning to fitness with new diamond standards in 5k, 5 mile and 10k. Whilst we were running Ekiden she was running Felsted 10k to get her latest standard. Her hubbie has also returned to his bike. She gives a lot to the club looking after all of the kit and will always be happy to give you advice as she is a qualified running coach. I will always have a soft spot for this tough cookie as I run my first structured sessions many years ago in her running group and she is the reason I joined Bentley. More words than normal but I felt she deserved it. Well done Barbara, however much you will hate it, you are the RUNNER OF THE MONTH FOR JULY. I am on my hols soon so will not be around for the latter half of August. I will be back for the Trail Run and Family Fun Day on 31 August. So runner of the month for August is over to you – you can discuss it in training, email me, speak to me on 31 August but I will be guided by you all as to who will be awarded August’s award. I will obviously be guided by the majority! !